The Evidence Hub is a new kind of website for your community to pool its ideas and debate different kinds of evidence. This Evidence Hub gives you a chance to have a play and test out the features a Hub could provide your community. These are the core building blocks. 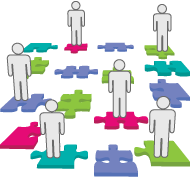 An Evidence Hub joins the jigsaw pieces brought by individuals into bigger pictures which you can explore and search in new ways. Explore the Comments that are being made - and Sign In | Sign Up to add your own. Explore Potential Solutions to the Issues - and Sign In | Sign Up to add your own, ideally, with some supporting/counter-evidence. Explore the Research Claims that are being made and the debate that surrounds these - and Sign In | Sign Up to add your own. Explore supporting and counter Evidence for Potential Solutions and Research Claims - and Sign In | Sign Up to add your own. Explore the Resources - and Sign In | Sign Up to add your own. Explore the Organizations - and Sign In | Sign Up to add your own. Explore the Projects - and Sign In | Sign Up to add your own. Click a user's name to see their profile, and their contributions to the Evidence Hub.